One thing I have grown to appreciate and absolutely love about learning Chinese language is the structure. 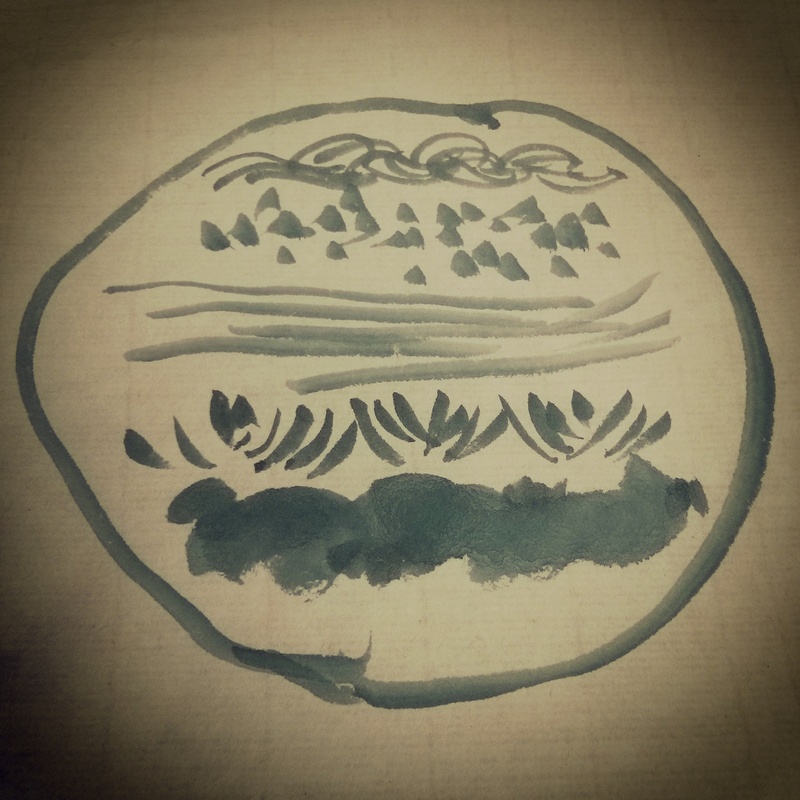 Today, I learned that Chinese traditional painting has an equally useful structural starting point. Take a look at the picture above. What do you see in each of these elements? No, they are not all perfect, this is just practice. But it’s by practicing these basic patterns, with a healthy amount of consulting the dictionary of brush strokes, that early students learn to follow the rules. And the next step? Painting a classic landscape with all the important elements. So what makes me so excited about this? First, I think the elements are beautiful. And the color is quite nice, too. But, what I love even more is the idea that structure gives way to focus. And focus means freedom. Though we may start with a full set of constraints, slowly and ever so surely, a mastery of these brush strokes, these elements, these rules, will allow the artist to ultimately find their own voice and style. Welcome to the ultimate form of freedom. In the midst of a day of damp and drizzle there was warmth under the pavilion at the Yale Farm thanks the Yale Sustainable Food Project and a fellow named Francis Lam (note the second to last line on his bio, it’s worth the one minute distraction). “Why I talk to Americans about food” was the 20-minute starting point that sparked a longer group chat. I found a number of things he had to say – aided by his delivery – extremely powerful. And at some points, I was very much moved. Today I became a big Francis Lam fan. Here are a few of my takeaways in (almost) chronological order. Lauren from Biloxi, Mississippi told Francis an incredible story about how eddo (taro root), something prescribed to her to take, something she absolutely abhorred, became something she developed a taste for, something that helped her get her life back, bowl by bowl. Lauren also gifted Francis with a fuller understanding of what it means to end up someplace when he asked how she (a woman from Barbados) ended up in Biloxi. “I didn’t end up in Biloxi. You end up somewhere when you try to go somewhere else and find you’re not appreciated there. I came to Biloxi.” You can read a story about Lauren here. If you can talk about food and talk about football, you can talk to 75% of people in America. I like to write about the stories of other people. The ones people that entrust with me when they talk to me. As a kid, a friend told him, and he self-confirmed that people wouldn’t like to talk to him because he was Chinese. Different. What talking means on the surface is something different underneath – it means you belong. Food is also a powerful way to talk about culture. I eat food because I love food. I cook food because I love food. But I write about food because I love people. We don’t often talk about how food can not be all sweetness. We don’t usually talk about how complicated our relationship is with food and how complicated our relationships are with others. “What in God’s name is that awful smell?”, the day he threw out his lunch was the day he learned a lesson about shame and assimilation. Power is all value-neutral. Food, like many things, can do as much good as it can do harm. He referenced an interesting extended conversation with Eddie Huang (chef and owner of New York’s BaoHaus), which started with this article by Francis in the New York Times (“Cuisines Mastered as Acquired Tastes”) and continued as a conversation between Francis and Eddie with “Is it Fair for Chefs to Cook Other Cultures’ Food?” Francis says the crux of the conversation ultimately boiled down to what it means to call something American. Francis thinks that America celebrates immigrants as a larger part of American culture. That America is a concept, not a place. And if America is great because of the American dream, then our strength is in our diversity. Why not look at who we are trying to be rather than focus on where we fall short? It’s not necessary to give up who and what we are to blend in. We’re not a melting pot, but a mixed salad. In America, you are part of my salad and I’m a part of your salad. And we should talk about it. Maybe we’ll have a good time, maybe we’ll walk away from each other. In the end, it’s not so easy. But when we’re talking, we belong together. And more from the discussion that followed. When someone talks about something authentic, the first questions that come to mind: where is it from (chances are more specific is more ‘authentic’) and what time period? As most people, culture, things are constantly changing, to define authenticity, it’s important to know when and where it comes from. When it comes to the conversation around cultural appropriation, who really owns what? There can be great power to be able to go to a place and leave. For those who come and go, the experience may be devoid of a lot of history and context. For others it may already confirm what they thought they knew / wanted to know. And feelings can sometimes be quite complicated when something you’ve been eating for your entire life, something that you may find a little bit tiring, and at some time may have even been a bit ashamed of, becomes popular. If the opposite of authentic is inauthentic, then where does something like authentic Thai-American food fit? And what about food throughout the diaspora? How does American-Chinese food differ from African-Chinese food? Then there’s food from the Congo you find restaurants owned in France by Chinese people. Also, there are more Chinese restaurants in America than McDonald’s. Restaurants will also go through different phases of development – from the places to ‘feed our people, our food’ to catering recipes to a different set of taste buds. Politics doesn’t have an answer to assimilation issues any more than we do. Where do traditional national narratives fit in our increasingly globalized melt… mixed salad? A very thoughtful question: What does it mean when America spreads its food culture around the world? Is it burgers and fries served on every corner of the earth or is it the rise and spread of processed foods? Looks more like #2, which changes the culture of eating – both the social dynamics as well as the nutritional value in food. There was some feelings discussed at the intersection where nostalgia meets horror at why Lunchables were once such a sought after lunch item. Inside their lunch box/bag was a freshly made lunch with whole foods while they longed for that purely processed bento box of a snack pack. Isn’t it interesting that there are many people in America who don’t really, regularly, or ever cook for themselves until college and beyond? What if kids started cooking earlier? How would this change their relationship with food? One of the biggest takeaways from the day with Francis was this idea of when we’re talking, we belong together. It hit me right in the gut when he said it and moved straight towards my heart. I decided to put in that whole line into my Google images search. What came out? 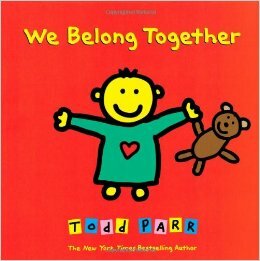 An interesting book cover for a New York Times Bestselling Author (also an illustrator) named Todd Parr called, We Belong Together. At first thought, even though we’re operating with a salad bowl approach in mind, a book about adoption and families didn’t seem to be the best fit. But as I thought more about it, talking, being together is ultimately about adoption and the acceptance of our ideas and each other. And family, or community, is the manifestation of more and more of these positive relationships, bringing us together to a place we feel we belong. 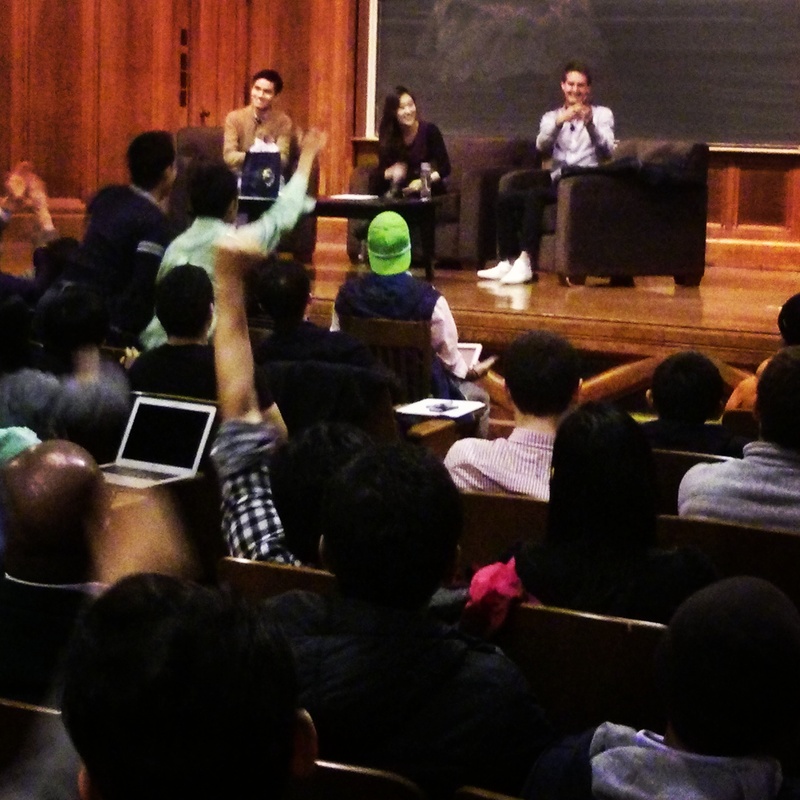 Thanks to an event hosted by the Yale Entrepreneurial Society and Yale Entrepreneur Magazine, Evan Spiegel, CEO of Snapchat came to speak at Yale today. Here are some of the things I found interesting. Snapchat is part of the conversation to use a photo as a communication tool vs. a documentation tool. Evan gets excited about the conversation to change the nature of what a good photograph is. Example – a fuzzy photo with the caption, “my phone is drunk.” Not a ‘good photo’ that would be found through regular filters, but becomes good with the snap and the chat are combined. They wanted to go from people taking 1 photo per week to opening their camera 10x per day. How do we do that? Communication is faster and more common than documentation. They want to continue to look at the camera as an interesting software tool beyond capture. Is Snapchat the communication tool you use most? Evan himself uses Snapchat, but text and phone are his top 2 go-to communication tools. What was an advantage or disadvantage that came up with the company in LA? With the company based in LA, attracting top talent was a major concern and question for some on the team. It turned out to be a great filter, meaning the early team was mostly self-selecting folks, who were willing to leave their comforts to join a new family in LA, because they fully believed in the vision and wanted to be a part of it. The majority of the team is not originally from LA. Why doesn’t Snapchat have groups? 1) Wanted people to feel included (i.e. not disincluded). 2) Wants Snapchat to be more representative of how your relationships change. Maybe you’re closer this week vs. last or vice-versa. Not locked into particular groups where you might not be comfortable with some of the people there. Building a business is different than having a great idea. Need to work on both of these IF you want to do both jobs. Fortunate to work with people who believe that making mistakes are a part of becoming a good CEO. As Founders, set up a system from the beginning to ensure they could make mistakes and couldn’t get kicked out of their company. The photo above comes from today’s event. Evan is taking an Our Campus Story video (see Oct 17 announcement via the link). Everybody got a little excited.